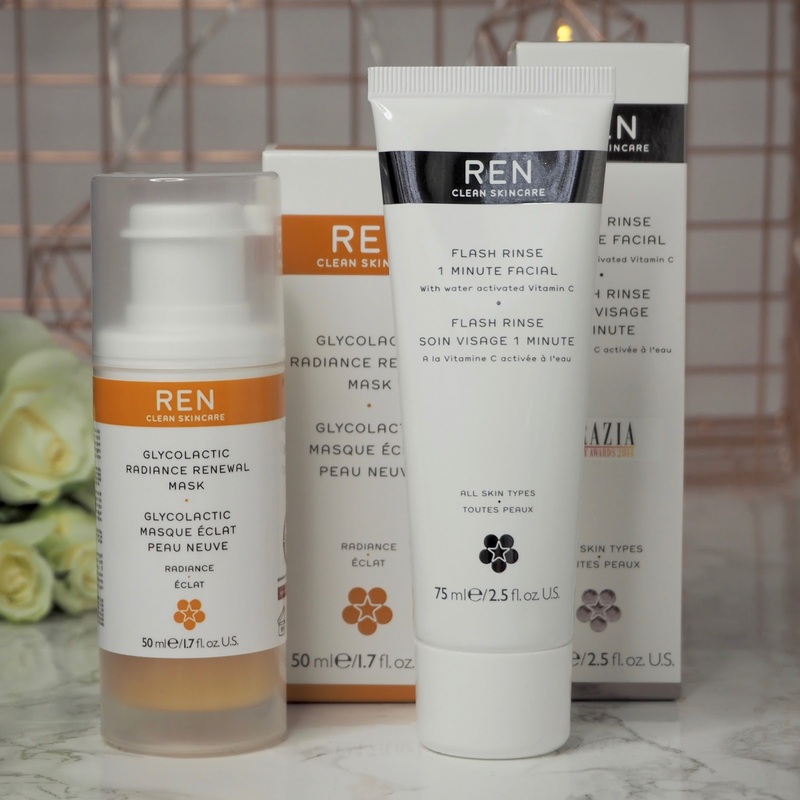 First up, the REN glycolactic radiance renewal mask - bit of a mouthful - try saying that three times fast! 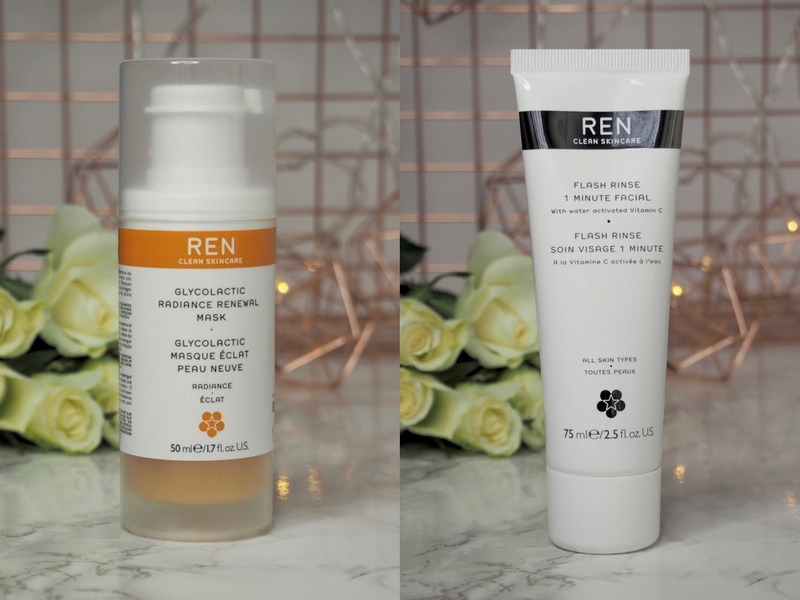 Slightly complicated name aside, this is an exfoliating mask containing four types of fruit acids and it's designed to leave the skin looking radiant and glowy with improved tone and texture. I was particularly interested in trying this one as it's said to be good for congested, mature and acne-scarred skin, and I can semi-tick all of those boxes. The mask itself is an orangey colour, and has a cleanser-like texture. I popped a fairly generous layer all over my face, avoiding the eyes, and left it on for ten minutes as the instructions say. The instructions also mention that you might experience some stinging - I'd say I felt more of a tingle than a sting - it wasn't uncomfortable and I took it as a sign that the mask was doing its thing. It's not the most important factor of course, but I feel compelled to mention that the mask smells rather lovely - fruity and fresh. Once time was up I removed the mask with the cloth that comes included, and took a look in the mirror. 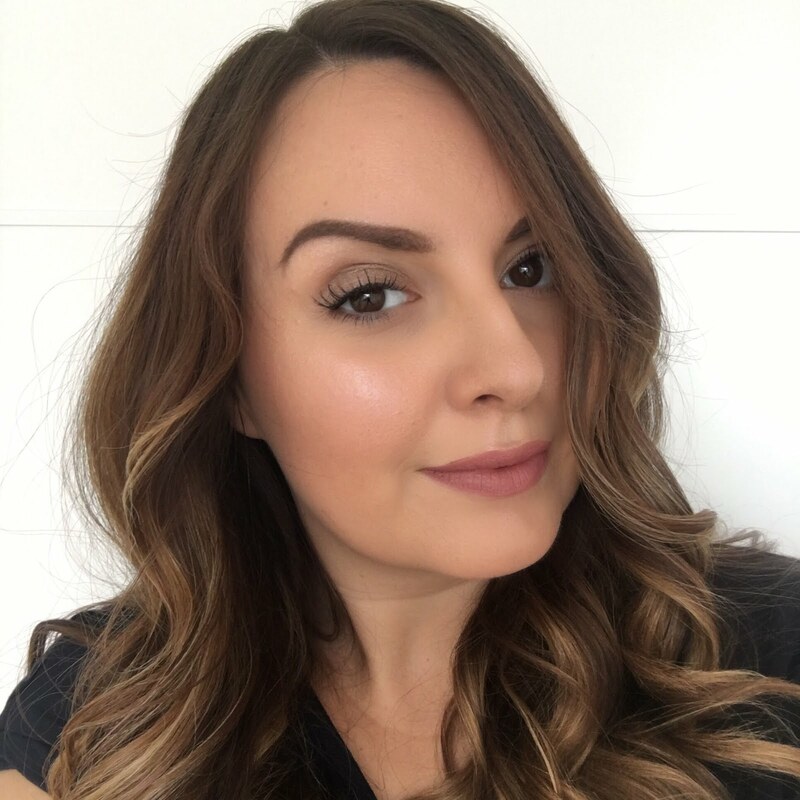 My skin was certainly looking more radiant, bright and super-clean, but for me the wow factor was how smooth my skin looked and felt - I've used a fair few chemical exfoliators before, but this one really works a treat! I'll be using this once a week from now on. 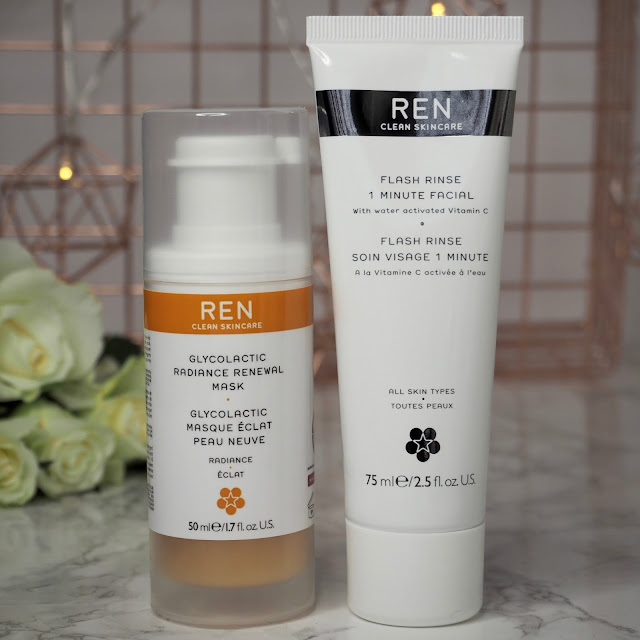 I've also been trying the REN Flash rinse 1 minute facial - but not at the same time as the glycolactic mask - this one's more of a product I'd use in the morning to wake up my skin when it's looking particularly tired and dull. The beauty is that it's something you could use any time - even in the morning rush before work, as it only takes a minute! The Flash rinse 1 minute facial contains vitamin C to brighten dull skin in just one minute. It's suitable for most skin types is also designed to remove those yucky blackheads Grabbing the tube post-cleanse in the morning, I've been applying this paste type formula to the skin and massaging it in with wet hands. It has a gritty consistency so I'm giving my skin some exfoliation whilst applying the product, and then I leave it to sit for just one minute before washing it all off and revealing cleaner, brighter skin with a defined glow about it. I've been using this every few days to keep my skin feeling buffed and deeply cleansed, but I'm tempted to use it every morning as it really gives my skin a boost and my makeup seems to apply better on the days that I've used this. 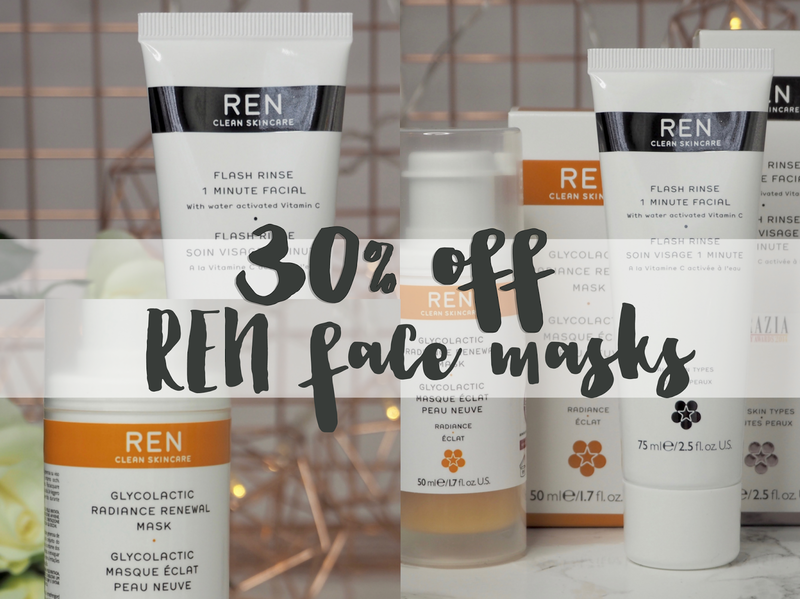 REN have plenty of other masks in their range which are worth checking out, especially while the 30% offer is on. I particularly like the sound of the Invisible Pores Detox Mask - who doesn't want invisible pores eh?! All of the masks I've mentioned plus a few more are available here - renskincare.com - and you can get 30% off with the code MASK30. Enjoy!